Pamplin Media Group - All aboard! The North Hillsboro Link shuttle service expands, adding hours, additional route stop. Bus service in North Hillsboro expanded this month, but it won't be TriMet buses you'll see all over Orenco and north of Highway 26. 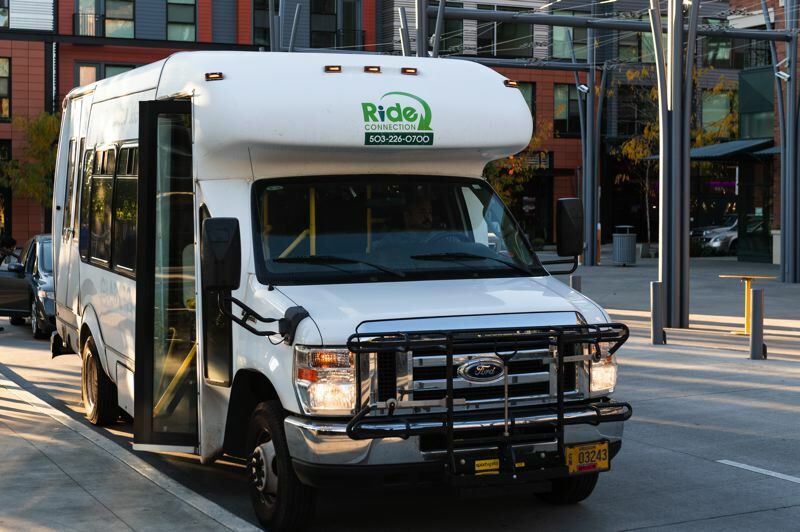 Three years ago, Ride Connection opened North Hillsboro Link, offering free limited bus rides from Orenco to Ron Tonkin Field and other parts of the city. 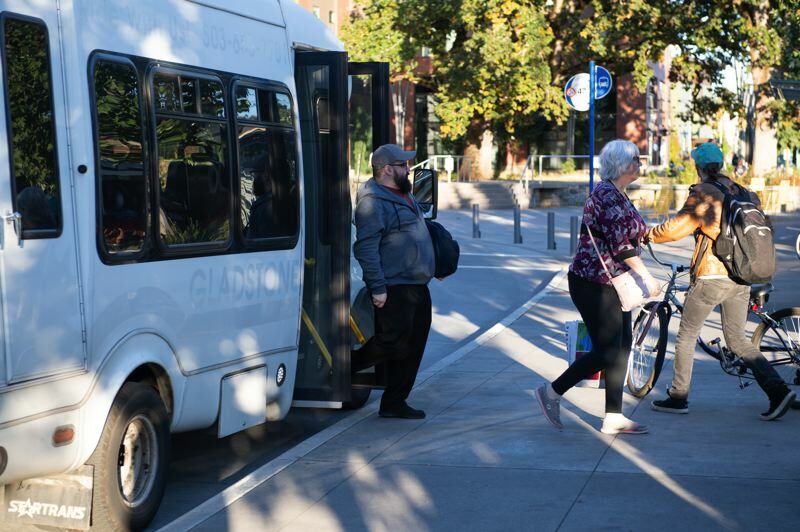 Starting Oct. 1, Ride Connection expanded service to the region, offering more weekday services. The buses also will operate on the weekends for the first time. A celebration of the changes will be held at La Provence Boulangerie & Patisserie, 937 N.E. Orenco Station Loop, this Friday, Oct. 19, from 8 to 9 a.m.
Ride Connection, the Portland-based non-profit which operates the bus services, works to provide transportation services to people across Washington, Multnomah and Clackamas counties. The group launched the free ride service to assist people who rely on public transportation, but where public agencies have fallen short on providing buses. The group operates two other shuttle services in Washington County, in Forest Grove and in Tualatin. The North Hillsboro Link connects Trimet riders from the Orenco MAX Station to "suburban employment" destinations across the fast-growing North Hillsboro area, with stops on Huffman Street, Pinefarm Place and Westmark Center. As of Oct. 1, the extended hours of operation, and slight change in route, helped to meet the growing demand of the area, said Julie Wilcke Pilmer, CEO of Ride Connection. The expansion brings more than five hours of additional service during the weekdays, and the shuttle service will now operate more than 15 hours on Saturdays and Sundays. Wilcke Pilmer said the services began as a partnership with local businesses. Businesses have flocked to Northern Hillsboro, but the area has little options for people who take public transportation. Working with the Hillsboro Chamber of Commerce and TriMet, the original shuttle route was designed in 2015 and has been expanded after local businesses and customers asked for additional stops. Reser's Fine Foods, one of Oregon's largest businesses, broke ground on a new 310,000-square-foot facility north of Highway 26 in 2013, moving production from its two Beaverton plants to Hillsboro. The company makes deli salads, side dishes and prepared foods. "The (Hillsboro) Chamber and (Chamber president) Deanna Palm were very instrumental in ensuring that we understood the unmet needs," Wilcke Pilmer said. "I think that more and more businesses were moving out into that business area, and I think the catalyst was (Reser's Fine Foods) moved out there too." The new bus route will expand to accommodate businesses along Northeast Bennett Street in Hillsboro, Wilcke Pilmer said, primarily for Wells Fargo's new call center, 23175 N.W. Bennett St.
Wilcke Pilmer said additional stops are also an option in the future, and riders can request a new stop. "One of the great things about the Hillsboro Link Service is not just the connection to TriMet and the business centers out in North Hillsboro, but also if we haven't captured all of the unmet needs, it is set up as what we call a deviated system," Wilcke Pilmer said. "Somebody can call in and ask for off-route stops or pick-ups, so that way if a new business pops up in that area or somebody changes jobs and our bus isn't stopping close to where they are working, as long as it is within a certain zone of that Hillsboro link, they can request a stop anywhere on the route or even off the route." The call center, which hasn't yet opened, will have weekend shifts, she said. Reser's Fine Foods and Amazon being located nearby also adds to the demand of that area. The expansion in shuttle service is funded with the state's transportation package, which lawmakers passed last year. Those funds aren't yet available, Wilcke Pilmer said. In the meantime, the city of Hillsboro is providing the gap funding. "This really fine-tunes the weekday schedule to ensure that more shift changes can be accommodated by the shuttle services that connects them to Orenco Station," she said. "And by adding weekend service, there is a larger population of employees that will be able to use transit to get to their work sites."